12/30/2014–Charlotte, NC– NC 137 welcomed the fall season with two events, a full tour of CLT’s Airline Flight Training facility, and a meet with the Charlotte EAA chapter. The CLT airline flight training tour on Oct 8th was conducted by director of the facilities, Howard Garbee. NC-137 members were also accompanied by Ronald Sadler and Malcolm Bennett, both who are US Air 757 pilots. They gave the squadron valuable insight into airline training. presentation led by Lt. Colonel Tom Schick, benefitting Charlotte's EAA chapter. 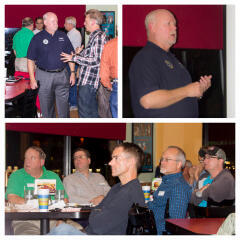 The EAA event took place November 17th at the 7th St Showmars Restaurant in Charlotte. Both the gathering of EAA Charlotte members and a few CAP officers bonded with much of the conversations centered around the advancement in general aviation, and experimental aircraft. Within this time members ordered food, drinks and shared some laughter, as stories were told. One such narrative was related to a damaged piston that occurred in flight. The two members involved gave their recount of the event as they shared a picture of the badly damaged piston. EAA chapter president Alex Becker addressed the group providing updates among their members. One of those updates came from EAA Member, who will be beta testing a new technology device later in the year. The device functions as a heads up display via wearable eye glass providing live data. Soon it was time for Lt Col Schick to give his presentation. It was a very comprehensive overview of CAPs purpose and mission. The room was fully attentive and a great Q&A followed, along with shared experiences from both the CAP and the EAA side of the house. Lt Col Schick left an atmosphere of time well spent on both sides. director In the Charlotte EAA chapter.